Irishman With Wife & Kids Has English Football Club Crest As Profile Pic. A 45 year-old Irishman with a wife and 3 children has the Liverpool football club crest as his profile picture on Facebook. 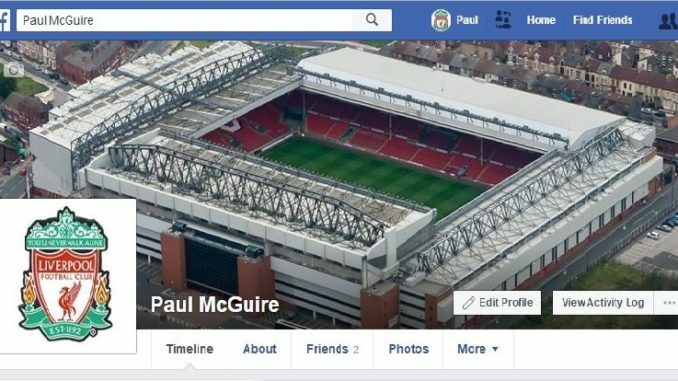 Paul McGuire from Drogheda in Co. Louth also has an aerial view of Anfield as his cover photo and sees nothing sad about either. Of course Paul is not alone. Damien Egan is a born and bred Dubliner with a wife and two beautiful twin daughters so naturally his profile picture is the Manchester United crest. Brian Fitzpatrick is chairman of Galway’s Manchester City supporters club and has been supporting his beloved City for well over two years now having previously supported his beloved Chelsea. Brian’s son Ciaran is a promising young footballer and recently made the local papers after scoring a hatrick for his school’s under 12 side in the regional Schoolboy Cup Final. It was a proud day for Brian who changed his Facebook profile picture that night to the Manchester City crest. Experts say the profile picture we choose on social media says a lot about us and represents who we are as individuals. It shows the world how we see ourselves and apparently lots of Irish people see themselves as an English football club.